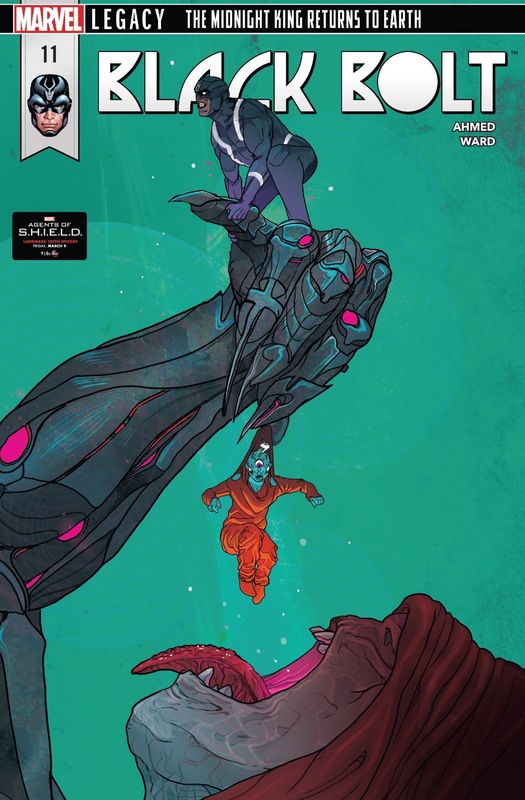 It’s the penultimate installment of Saladin Ahmed and Christian Ward’s stellar Black Bolt series as the story hurdles toward its conclusion with all of the wild, mind-bending, cosmic awesomeness we’ve come to expect. Black Bolt and his alien ward, Blinky, had escaped the terrible space prison and its despotic Jailer, yet it is revealed that their escape was not as complete as originally thought. The Jailer is an ancient Inhuman and a type of psychic vampire who had fed on the emotional pain of his prisoners. Somehow, a fragment of his psyche managed to escape his destruction and take root in the back of Blinky’s mind. Blinky is a powerful telepath in her own right and The Jailer has been able to seize control of these powers, taking over her body as well as her ability to manifest concrete illusions. He has transformed her into his former self, a towering ghoul with vast destructive power. The Jailer’s ability to take control of Blinky’s body and powers was facilitated by the intense stress and trauma of witnessing the Inhuman known as Lash nearly killing Black Bolt. Lash had hatched some harebrained villainous scheme to create new Inhumans by way of weaponizing Black Bolt’s blood into a new Terrigen Cloud. The process poisoned Black Bolt and he was about to perish when the terror of it all caused Blinky’s defenses to drop, allowing The Jailer to assume control. Now free, the Jailer is hungry. He grabs the nearest morsel, one of Lash’s minions (an Inhuman named Jack Chain), and consumes his energies leaving behind nothing but a burnt husk of a corpse. Lash’s other minions flee yet Lash himself is unafraid. Lash strikes with his own energy blasts but they have no effect. Before he can fully realize his folly, Lash is also swept up in the Jailer’s giant hand and he too is fed upon and destroyed. Titania and the weakened Black Bolt can only look on in horror. Titania recognizes the Jailer from the psychic images Blinky had relayed of her husband’s noble sacrifice in facilitating their escape from the prison. Realizing that this was the same monster who had killed her husband Titania is intent on getting revenge. Yet Black Bolt knows that the two of them are no match for the Jailer; furthermore, Blinky must be trapped somewhere inside of the monster and he cannot risk harmer her. Much to Titania’s dismay, Black Bolt sweep her up in his arms and uses his flight to beat a hasty retreat. Although his powers have been diminished, doubly so due to Lash’s poisoning, Black Bolt still cannot speak without unleashing destruction. He is unable to fully explain to Titania that they must find a way to defeat the Jailer without harming Blinky. 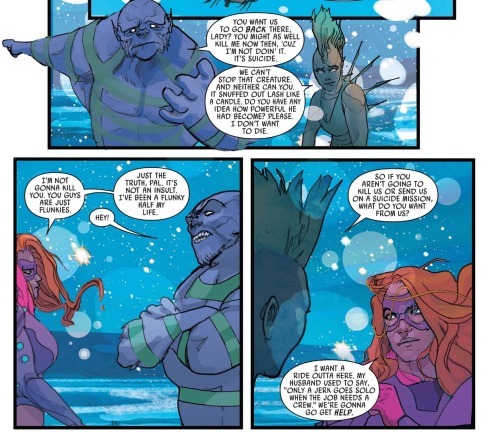 There is no means to relay this matter and Black Bolt is still quite new to the notion of depending on others. So he simply leaves Titania behind and rushes back to do battle against the Jailer; hoping against hope that he might somewhat prevail and save his young ward’s life. Although enraged over Black Bolt’s interference, Titania can tell that the Jailer is too powerful for her to defeat on her own. She needs aide… she needs a crew. Titania encounters a pair of Lash’s former minions, Sheath and an as-yet unnamed Inhuman (who I’m just going to call Purple Nurple). Titania opts not to fight the two; they are simply Lash’s flunkies. Titania has been the pawn of villains like Lash herself, she knows the drill… they are just angry souls like herself looking for a sense of purpose and direction, an outlet for their anger and fear. In short, they can be used and Titania recruits them to take Black Bolt’s flying car back to The States so that she can gather reinforcements. The narrative switches to somewhere on the astral plain, the psychic realm beyond the physical world. Blinky’s psych, her sense of soul, has fled to this astral plain, evicted by the terrible Jailer. Aspects of the Jailer’s corruption continue to pursue her, in the form of sickly black tentacles. This blackness surrounds Blinky, consumes her. She is about to be snuffed out from it when a new energy emerges. It is not clear what or from where the help has been beckoned but it arrives in the form of Black Bolt’s son, Ahura, who has himself been drawn into the astral plain. Ahura was born with psychic abilities and had these powers greatly augmented when he went through Terrigenesis (back in Uncanny Inhumans #0). He’s a powerful telepath and though perturbed over being brought into the astral realm against his will is also impressed over Blinky’s having done so. Yet Blinky professes that it wasn’t her doing; suggests instead that it was Black Bolt who called out to him. She can feel that Black Bolt is battling the Jailer back in reality; and that the battle is going poorly for him. It is difficult for Ahura to accept this notion. He has had a very acrimonious relationship with his father; it’s hard for him to believe his dad capable of asking for help, much less his help. Ahura collects himself after trading some harsh words with Blinky. He apologizes to the child; he was cruel to her when they first met, but it was only because she made him feel jealous. 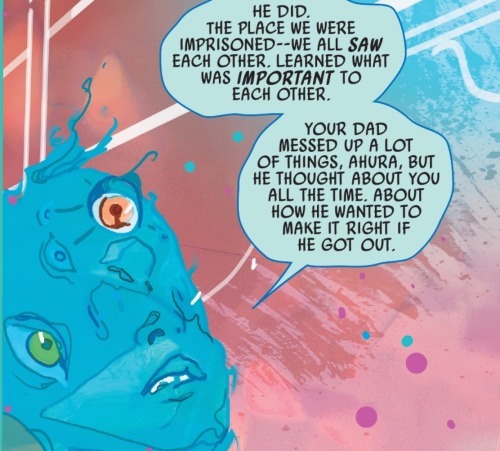 Black Bolt had been such a lousy father to Ahura, it angered him to see his dad act in a paternal fashion toward this new kid. Blinky felt sort of like his replacement and it made him spite her. Yet that wasn’t her fault and it was wrong of Ahura to take out his anger on Blinky. It’s nice to see that despite his troubling childhood and poor upbringing, Ahura nonetheless has the ability for self reflection and empathy… as well as the ability to acknowledge and apologies for mistakes. The contours of the astral realm begin to shift before the two can discuss these matters any further. Suddenly the plain takes on the attributes of the space prison where Black Bolt and Blinky had been incarcerated. Ahura’s psychic abilities enable him to witness and feel the terrible traumas that his father and Blinky experienced in the prison. Having tasted this terror Ahura comments that it is no wonder that the ordeal had so affected his father. The specter of the Jailer pursues Blinky and Ahura. They have to run and as they flee through shifting parameters of the space prison the setting begins to change and mutate, transforming into something more familiar to Ahura. They have traveled to some new corner of the astral plain and he recognizes the architecture as being of old Attilan. They come across what appears to be a laboratory where two Inhumans are conducting terrible experiments on a young child. Blinky initially assumes that this scene must be some kind of trace memory of something awful that had occurred in the space prison… but Ahura knows better. These Inhumans are the former king and queen of old Attilan. 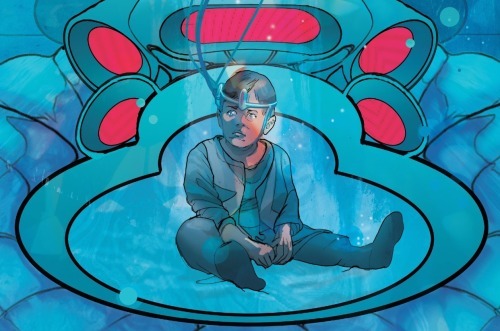 They are Agon and Rynda, Ahura’s grandparents… and the child they are torturing in the pursuit of discovery is Black Bolt himself. Elsewhere, Titania along with Lash’s former minions race back to America in the flying car. Sheath and Purple Nurple just want to escape, but Titania has other plans. She wants to gather up her former colleagues among The Wrecking Crew and utilize their combined might to return to Greenland and destroy The Jailer. Suddenly Lockjaw teleports into the car! No sooner than he arrives Lockjaw teleports away, taking Titania with him. The two arrive at the graveyard where Titania had buried her husband. She is confused and upset and tries to rationalize with the giant Inhuman dog. She demands Lockjaw take her to gather her allies, but is unsure if Lockjaw can even understand her. Lockjaw has plans of his own and he leads Titania to the grave of Crusher Creel. Her sadness overtakes her once more and she asks why Lockjaw has done this. The question is suddenly answered as the ground at the gravesite is disturbed and begins to stir. A hand emerges from the rock and soil, the art itself begins to take on the form of a man. Crusher Creel, The Absorbing Man, has somehow returned to life. He smiles at Titania and asks his wife what he’s missed. And it is with this surprising turn of events that the issue comes to a close with the promise of a concluding installment with the next (and sadly last) issue. Holy crap! Yet another exciting, psychedelic and thoroughly captivating ride! It’s surprising to be so continuously surprised by the twists and turns that Ahmed and Ward throws at us throughout this series. The first couple of pages were a bit heavy on exposition, spelling out what had happened to cause Blinky to be infected and overtaken by the Jailer’s psyche. With this I sort of expected the rest of the issue to proceed in a more straight-forward fashion, with Black Bolt prevailing through some manner of ‘love conquers all’ type deus ex machina resolution. Nope… Instead a left turn is thrown in and it makes for a terrific and satisfying twist. It remains mysterious what exactly is going on. The Jailer gains his energy by way of feeding on emotional turmoil. He has been able sustain himself on Blinky’s past trauma and she has fled to the one place she feels safe: Black Bolt’s mind. 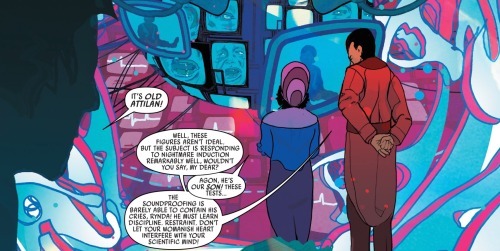 I’m not sure she is actually in the astral plain, but is rather in the intangible realm of Black Bolt’s psyche. Ahura has been beckoned and brought in as perhaps a secret weapon. Not only in that Ahura possesses formidable psychic powers of his own, but also because a sense of reconciliation between Ahura and his dad may be what turns the tide against the Jailer. If negative emotion is how Jailer sustains himself, then it stands to reason that positive emotion could weaken and destroy him. Ahura and Blinky are made to see what Black Bolt endured in his childhood, the atrocities afflicted onto him by his parents. 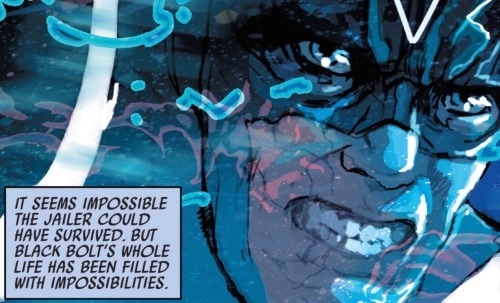 Agon and Rynda’s tinkering imbued Black Bolt’s voice with vastly destructive properties and the nature of this power has forced him to keep his feelings constantly in check. 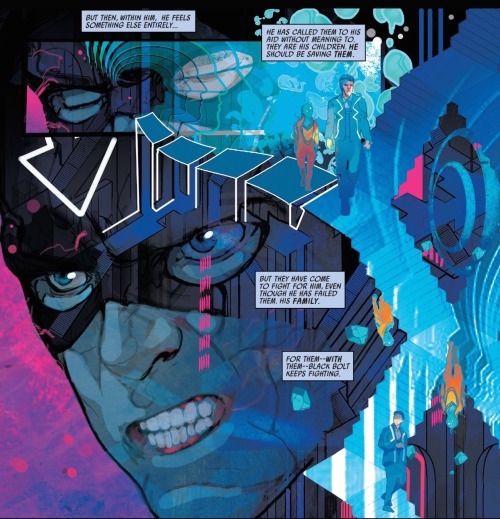 Even the most subtle of sighs or most quiet of laughs could unleash absolute carnage and it forced Black Bolt to be entirely withholding, completely restrictive of his feelings. …Of course all this left Black Bolt a rather lousy husband to his wife and seemingly neglectful father to his son. If Ahura can manage to be able to understand this, see why his father is the way he is and comprehend the great sadness and regret it has caused his dad, then perhaps Ahura might forgive him. Forgive Black Bolt and allow for a new beginning and a new relationship… one based on mutual understanding and support rather than sorrow and resentment. If such a thing could be forged between Black Bolt and his son; if something similar could also be created with his former wife, Medusa, it would surely create a huge swell of happiness and relief. A wave of positive emotion that could destroy the Jailer the way that sunlight destroys a vampire. 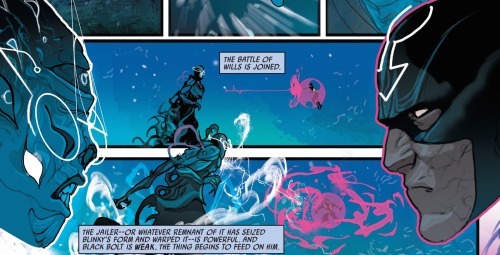 And by destroying the Jailer, Black Bolt will succeed in saving Blinky. And if that weren’t enough, we are also treated to some great character beats for Titania. She could have so easily been rendered a perfunctory presence just there for effect. But that’s not how things go in this series; the characters are built up and feel real. Titania’s anger and desperation for revenge against the Jailer is palpable. And I love the interactions between her and Lash’s goons… the sense of sympathy Titania has from one former flunky to another. 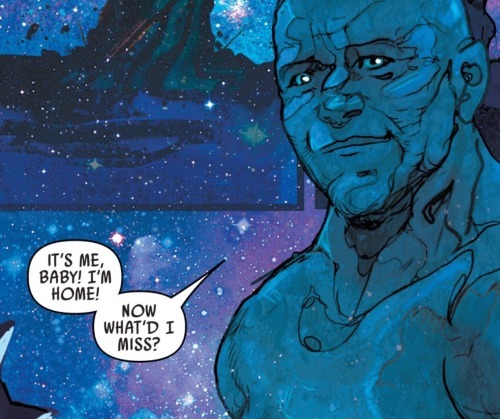 Resurrecting The Absorbing Man is just a gift… a gift to Titania and to us readers. Creel is such a fun character and his role in this series has made even more fun. It may seem a little like a cheat to bring him back, but it fits in that The Absorbing Man has returned in this fashion a couple times before. Perhaps Ahmed and Ward would have held off on bringing Creel back were the series to continue past the next issue. In that the series is ending, however, bringing Creel back for the finale feels right and I just cannot wait for the big ending. And then on top of that, there also another awesome pop in by Lockjaw. I should have seen it coming, but was just as excitingly surprised to see Lockjaw teleport in this time as I was when he showed up back in issue four. That big old pupper is such a good boy. The setting of the astral plain (or perhaps Black Bolt’s psychic realm) loans itself so nicely to Christian Ward’s illustration. He is able to cut loose and depict impossible visages that are a feast for the eyes. Ward’s ability to effectively transition back and forth from this realm to the more grounded setting of Greenland, the flying car and the graveyard is rather impressive. More to the point is the way that Saladin Ahmed script and Christian Ward’s illustration gel together. They have established a synergy that is some next level awesomeness. This is comics at its best. As excited for the finale as I am, I’m also a bit nervous over it. Endings are difficult and there is a lot of matters for Ahmed and Ward to tie up. Yet, if they are able to stick the landing and wrap up the 12th issue with the same level of terrificness as the proceeding eleven issues, then Black Bolt could very well go down as one of the best comic book series of all time. Naturally I’m biased, but I’ll stick by the hyperbolic statement any day of the week. So it goes without saying… definitely recommend. Once more, five out of five Lockjaws.